The BCC reports that the University of Abertay in Dundee, Scotland will install six new lamposts that use light-emitting diode (LED) technology to provide bright light using low power derived from built-in solar cells. The lamposts will also incorporate wireless internet routers to provide public wi-fi access and will be installed on the roof of a university building. The university also has plans to install up to 4,000 more in a student village to be built soon, according to the article. They are distributed in Scotland by Kirkxaldy-based Compliance Technology (CTL) who have exlusive European distribution rights for the lighting system. "With only a fraction of the installation and running costs of conventional street lights, [cities] could use smart lampposts to provide street light while selling internet access to local residents, or even providing it free in areas of need. The new photovoltaic technology which will be showcased in Dundee will mean that no local community needs to be without reliable, economic street lighting, with the added benefit of wi-fi technology outside their front doors. Mary Cowie, director of the University of Abertay Centre for the Environment (ACE), said, "The pilot scheme will involve not only ACE but students from the University of Abertay who will be able to play a hands-on role in shaping the technology of tomorrow." The centre will be involved in testing the technology and assessing its social, environmental and economic impact, according to the article. Green MSP Robin Harper had these words to say about the project: "This is a truly exciting and innovative project with huge possibilities in sustainability terms, and in reducing environmental impact." 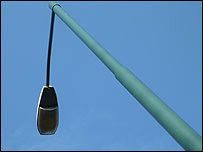 According to the BBC article, CTL said three other city councils in Scotland had already expressed interest in installing the lamps: Orkney, Perth and Kinross, and Dumfries and Galloway. This is an excellent idea combining three of my favorite technologies that I hope will soon become ubiquitious: LEDs, Wi-Fi, and solar power. If these lamps truly cost "only a fraction of the installation and running costs of conventional street lights" then I hope to see these popping up all over the world. If that were the case, there would be no reason not to install these lamps when old street lamps expire or when new developments are built. Of course, it could all be marketing hype but time - and this demo project - will tell. I also know that a number of cities, including Portland, Oregon, are working on plans to install a city-wide Wi-Fi grid for residents and these street lamps could be a perfect component for such a system. Couldnt find a direct contact method, but just wanted to let you know that I find WattHead an interesting and unique take on the environmental issues facing us. I've added a link to WattHead in my sidebar at http://earthsentinel.com, my site devoted to peak oil, renewable energy, and climate change. I hope you will return the favor if you enjoy my site. Thanks Earth Sentinel, I'll poke around your site and add it to my links section. Cheers.